As the Wilson Swiss Open draws to a close it is China and Malaysia who will leave Europe with all the titles after between them they scooped all 10 European Super Series medals. Lee Chong Wei got revenge for his All England defeat by beating Olympic Champion Lin Dan in the men’s singles and Koo/Tan prevented any European success in this spring’s Super Series swing through the continent as they defeated Boe/Mogensen in the men’s doubles. 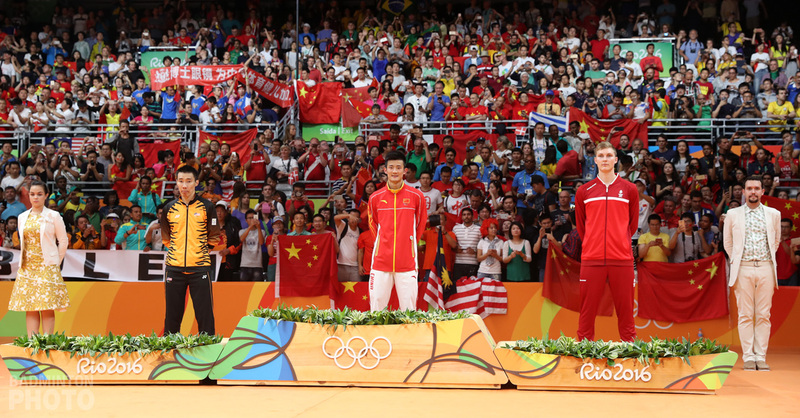 As the dust now settles on the first European leg of the 2009 Super Series global tour, Asian dominance prevails as China heads home with 8 medals and Malaysia with 2 after leaving it late in Basel to claim the men’s singles and doubles. 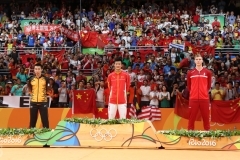 The men’s singles final was eagerly awaited and everyone expected Lin Dan to achieve the European double crown after his emphatic All England win just a week previous. Even in his post-match interview in Birmingham, Lee Chong Wei (photo) admitted that his Chinese adversary now had the psychological edge in their head-to-head games after Lin Dan’s victory but a week is a long time in sport! 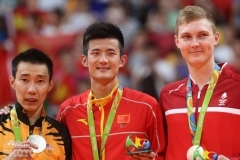 In the first game, it was the Olympic Champion who was dominant early on edging out a 13-9 lead but the Malaysian came back to tie it at 14-14 and even though Lin Dan took a slender 15-14 lead, the Malaysian once again bounced back to win six unanswered points to stand at game point at 20-15. Lin Dan managed one more point before Lee Chong Wei wrapped up the opening game 21-16. The second game was very similar to the first with once again both players being inseparable at 14-14. The Malaysian once again gained the end-of-game momentum and at 18-16 ahead rattled off the three points he needed to claim the game and with it the title as Swiss Open Champion. 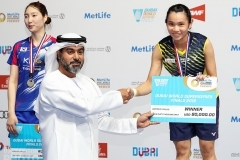 In the women’s singles, there was double delight for Wang Yihan (photo) as she claimed the Swiss Open title to complement her All England win just seven days previous. 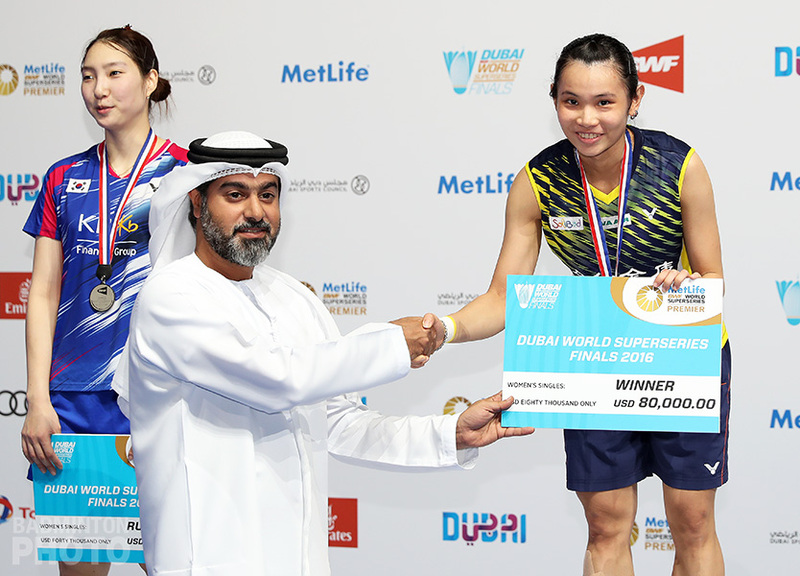 In a tough, three-game, all-Chinese battle, Wang overcame the stiff challenge of Jiang Yanjiao to fly home to China with two gold medals around her neck. After splitting the opening pair of games – each holding her opponent to 17 – it was the All England champion who took control of the deciding rubber at 11-11 as she sprinted out of sight of her opponent to take an 18-11 lead. There was no way back for Jiang at this stage and Wang controlled the remainder of the match to take a 21-13 win to serve as evidence that the Chinese production line of world class shuttlers continues to steamroll along. There was further delight for China as Zheng Bo / Ma Jin beat Olympic Champions Lee Yong Dae and Lee Hyo Jung in the mixed doubles final to send Korea home without a single title from Europe this spring as the Koreans also failed in the women’s doubles where Du Jing and Yu Yang beat Lee Hyo Jung and Lee Kyung Won in two straight games. 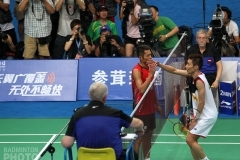 Malaysia claimed their second gold on Swiss finals day in the final match as Koo Kien Keat and Tan Boon Heong (pictured here on podium) put in a performance that hearkened back to their 2007 peak. The Malaysians beat the Danish challenge of Boe and Mogensen 21-14, 21-18. This win is sure to boast the faltering confidence of the Malaysian pair as many around the world had written this pair off after a series of hit-and-miss performances over the past few months. It is hard to believe that the Malaysian pair were without a Super Series win since Denmark in 2007 and with their third major tournament win in the last six months, Koo and Tan look determined to make that once-worrying slump but a minor footnote in a successful career. Best Western MERIAN – a 4 * luxurious and trendy hotel with direct transport to the Swiss Open venue in few minutes. The best place to stay to enjoy both the event and the beautiful city of Basel.